Photo Credit: Miss Chicago and the Californian Girls. Poster produced by the Feminist Art Program, Fresno State College (now California State University, Fresno), 1970-71. Photography by Dori Atlantis. The exhibition and symposium - A Studio of Their Own: The Legacy of the Fresno Feminist Experiment - documents the foundation of the nation’s first feminist art education program at Fresno State University in 1970, and its enduring legacy in contemporary art. Meeting off campus in a Studio of Their Own fifteen female students and instructor Judy Chicago helped pioneer key strategies of the early feminist art movement, including collaboration, the use of “female technologies” like costume, performance, and video, and early forms of media critique. During the feminist art movement of the 1970s and 1980s, women artists and critics not only seized full citizenship in the art world; they also changed the dominant paradigms defining the relationship between art, personal identity, and social values. During that dynamic period of cultural transformation, modern art and modernist art criticism, with their traditional quest for universal standards of formal perfection and artistic progress, gave way to the postmodernist understanding of art as a contested terrain—and a weapon—for negotiating value and meaning in a complex multicultural world. Many art history textbooks currently trace the roots of feminist art education in the US to the program established by Chicago and Miriam Schapiro at the California Institute of the Arts in 1971, overlooking its beginnings at Fresno State the previous year. 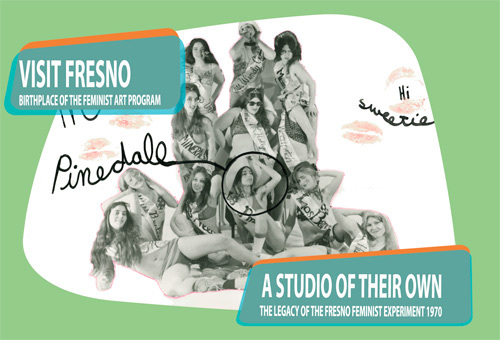 A Studio of Their Own draws attention to the fertile experimentation that took place in Fresno that year, experimentation that prepared the way for the collaborative feminist installation, Womanhouse, as well as the feminist art programs at CalArts and the Woman’s Building in Los Angeles.